Let's start with a little excerpt I read recently. It kinda stood out to me. This is from a magazine article published in 1897. "It is the true spirit of present-giving; and let not any of our readers despise it as childish; rather let them remember that that which costs no time, no thought, no self-sacrifice is but of little value in the eyes of affection, and pleases only where the gift is valued for itself, and not for the giver." This was over one hundred years ago. The pace of our lives has only increased since then - dramatically I might add. Our families (and communities) are more disconnected than they have ever been. Electronics rather than imaginations have become the babysitter. That said human nature is still within the hearts of children. Please keep all this golden information in mind as I present a couple of ideas for gifts. *A ream of paper along with a book or printed hand outs on how to make paper airplanes. Yes, they could do this on their own, but how about each person making one and having a flying trial to see which flies the fastest, farthest, straightest etc. * A loop of string. I love this one! Make it a nice sturdy string but soft to the touch and of a generous size. After all by the time you warp it around your fingers for a mean round of cats-cradle, it shrinks up significantly. You could even print out instructions from the internet if need be. I love this because it actually takes 2 people. It requires interaction. The gift is really the time spent teaching and playing the game and giggling at the funny faces made while concentrating on not making a big knot. * Table top bowling - bare with me here. A few clothes pegs and a marble (boulder) and there you go. 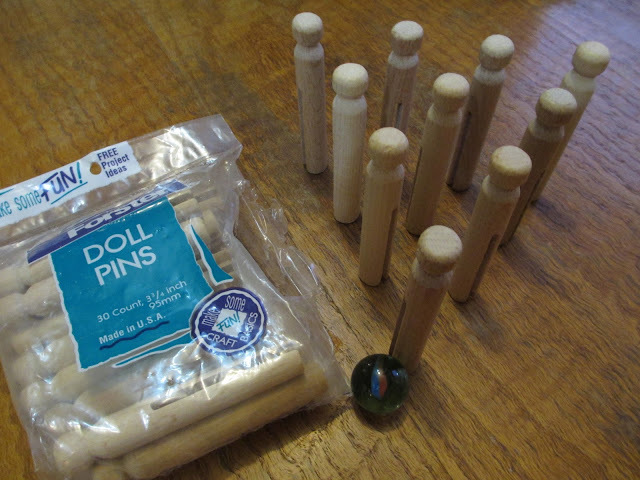 They are evidently called "doll pins" now - no hanging clothes with these. You can even include a length of felt if you prefer it to be a bit quieter. I of course had to try my skill at which Mr LB laughed. I got 9 then missed the spare. I pick these up at thrift stores very reasonably. I'll also share one from the past in case you missed it. You could color the "bowling pins" in the same way as the pick-up sticks. I love the feeling of Christmastime, but the consumerism not so much. I hope this gives you an idea or two or at least gets your thinker working creatively. And lastly, I would like to thank you all for your patience while we were without internet. We were back in service by Wednesday evening, but it's incredible how long it takes to get caught up on things like that - or maybe just back in the swing of things. I don't think the "doll pins" have the relieved (curved) entry to the slot, so they'll stand up. You are absolutely right Gorges. I have some of those (that I actually use for laundry) and I tried out of curiosity to see if the would stand - nope. These aren't smooth down the center either, just a rough cut. Glad to hear that you have Internet service again. I give out homemade soaps for Christmas gifts. Everyone seems to really enjoy it. It's fun to make, too. And rightfully so; it's wonderful. I taught my mom to make soap and now that's what she does for the same folks I would, but that's okay. I love simple, fun gifts - they are the best! Thanks for sharing on Homestead Blog hop!